The new Defender appears, sort of . . . 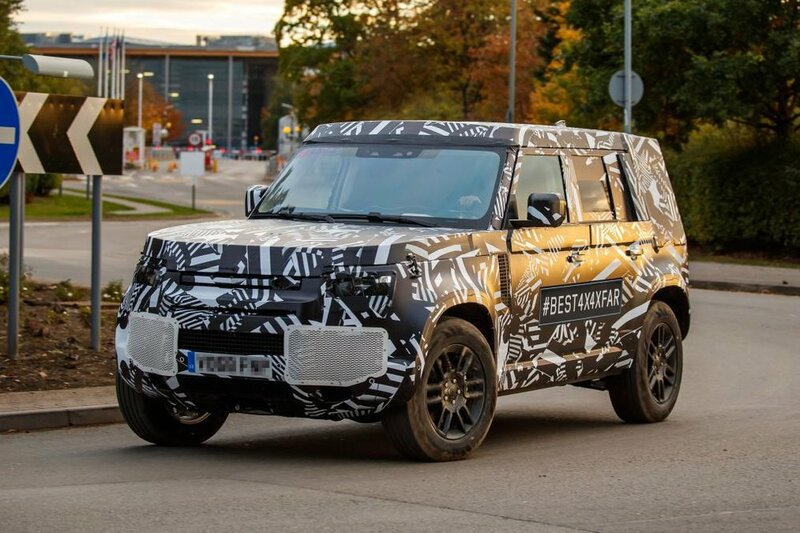 Currently making the rounds of forums, at last, is a photo of a heavily disguised test prototype of the much-awaited, much-delayed, resurrected and re-invented Land Rover Defender. The speculation about this vehicle has been on a level like nothing I’ve seen in the four-wheel-drive universe, even beyond the theories that swirled around Jeep’s re-designed Wrangler. The Wrangler rumor mill terrified aficionados with hints that the new model would lose its solid front axle for independent suspension—perhaps even on the rear axle as well. Then we heard its separate, fully boxed chassis would be abandoned for unibody construction, rendering it in the faithful’s eyes no more than a glorified jacked-up sedan. In the event, the new JL Wrangler stayed built the way God intended Jeeps to be built: solid front and rear axles, body-on-fully-boxed-frame construction. Parent company FCA managed to incorporate modern safety and convenience features into a decades-old blueprint, and the new Wrangler remains a superb choice for extended travel in rough country. Tragically, at least for thousands of traditionalist Land Rover faithful, the exact same rumors (or perhaps I should say rumours) proved well-founded as Jaguar/Land Rover gradually released details of the new Defender. The 2020 replacement for the 70-year-old expedition icon will ride on all-independent suspension and will be built on aluminum-intensive unibody architecture shared with other Jaguar/Land Rover products. Thus one thing is clear: The old Defender is dead and buried (recent outrageous £150,000 factory specials notwithstanding). No more will Land Rover ship CKD (Complete Knock Down) Defenders in crates to be assembled in developing-world countries and pressed into rough service in the remotest backwaters of the Realm. No more will adventurous owners boast of accomplishing major drivetrain rebuilds with hand tools outside an Angolan village. The new Defender will be a completely different vehicle than the old one. The question is, will it be a better vehicle? J/LR swears the new Defender will be more capable off-road than its predecessor—not at all an outrageous claim given the huge advancements in traction control systems since the relatively primitive system installed in the last generation. And, honestly, it won’t be difficult to exceed the capabilities of the pre-traction-control Defenders, which relied solely on gearing and compliant suspension to negotiate challenging terrain, thanks to Land Rover’s obstinate decades-long refusal to fit cross-axle differential locks. Even the independent suspension will only be a handicap in certain situations, such as when both front wheels compress upon hitting an obstacle, reducing clearance to the fixed front differential. It will certainly enhance ride and handling. And while traditionalists might not like it, unibody construction actually results in a vehicle with far higher torsional rigidity than a vehicle riding on a separate frame, even a fully boxed one. You simply lose the ability to unbolt the body from the chassis with your sockets and wrenches. And repairing collision or trail damage on a unibody vehicle is considerably more involved. So the capability will be there. Whether J/LR offers the new Defender in suitably basic form to satisfy those who eschew leather and carpet and 10-inch entertainment screens in their overland vehicles—as well as to create an affordable version—remains to be seen. One area where I suspect the company will get it right is styling—not that there’s much to tell from the disguised test vehicle. After the PR disaster that was the DC100, I’m willing to bet J/LR went to great lengths to evoke the original’s styling without being overtly retro. I predict it will look properly sturdy and adventurous. Thus we’ll have a capable vehicle that looks the part. The only remaining big question involves market placement. Will Jaguar/Land Rover aim for existing Defender owners, or will they exploit that iconic model name and shove it toward the upscale end of buyers, those who want the look and the rugged association, but who wouldn’t dream of actually shipping their rugged-looking vehicle around the Darien Gap or across the Strait of Gibraltar and exploring another continent? If you look at sales history I think the answer is clear. The last Defender—the solid-axle, separate frame, bolted-together genuine expedition machine, went extinct for one reason: It stopped selling. Why would Land Rover aim at the exact same customers with the new one? In some ways the decision will be out of their hands. A technologically advanced vehicle, built largely out of aluminum, with all-independent suspension, sophisticated traction-control and safety systems, and advanced powerplants, is going to be expensive to produce and will cost a lot to buy. I’ll wager the base price of the new Defender 110 (or whatever it will be called) will be substantially above that of the already dear Wrangler Rubicon Unlimited. The temptation to just go with that and load it up with leather and carpet and entertainment screens will be powerful. I’ll wager further that ads for the new Defender will be stoked with historical family references, and heavy on images in rainforests and sand dunes. Just which magazines those ads appear in will betray the direction the new Defender will take—towards the real jungle or the concrete one. Older PostThe versatile 1/4-inch ratchet . . .